RYANAIR HAS SAID it no longer plans to transfer jobs and planes to Poland after a deal with pilots – but faced a fresh Europe-wide strike. In a joint statement released today, unions across Europe threatened “the biggest strike action the company has ever seen” over their members’ working conditions. The strike, so far organised by unions in Belgium, Holland, Italy and Spain, is scheduled for the last week in September, with an exact date due by next Thursday. However the walk-out could be called off should a meeting of Ryanair shareholders on 20 September meet union demands, the statement added following a meeting in Rome. Separately, Ryanair said it had decided “to restore six Dublin-based aircraft which were due to transfer to Poland in November”. The airline announced it would do this after it reached a deal with its Irish-based pilots earlier this week. In July, Ryanair issued 90 days’ notice to more than 100 pilots and over 200 cabin crew under plans to cut its Dublin fleet from 30 to around 24 aircraft for the forthcoming northern hemisphere winter. Ryanair had blamed the move on a downturn in bookings and plane ticket prices in Ireland, partly owing to strikes by Ireland-based pilots. Since then, the pilots have voted to accept an agreement on improved working conditions. 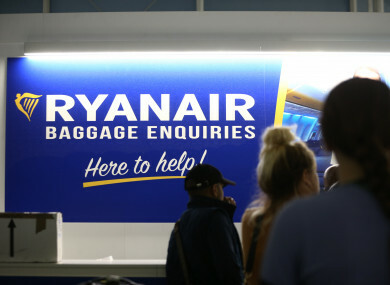 Ryanair last month faced a coordinated 24-hour strike by pilots, causing the cancellation of hundreds of flights across Europe, affecting thousands of passengers. While the carrier is for the first time recognising unions across Europe that represent its pilots and cabin crew, staff are unhappy that improvements have yet to be made on pay and other conditions. From Rome, the joint union statement said that “after a long summer of talks, meaningless meetings and an escalation of an industrial dispute that ended up in the first pan-European strike action in the history of Ryanair”, unions had no choice but to hold the September walk-out. But a final decision on staging the biggest strike yet would hinge on the outcome of the September 20 meeting of shareholders, it said. Email “Ryanair threatened with 'the biggest strike action the company has ever seen'”. Feedback on “Ryanair threatened with 'the biggest strike action the company has ever seen'”.